ROOSEVELT, Long Island (WABC) -- Two parents were arrested this week, accused of endangering their child while disciplining him. 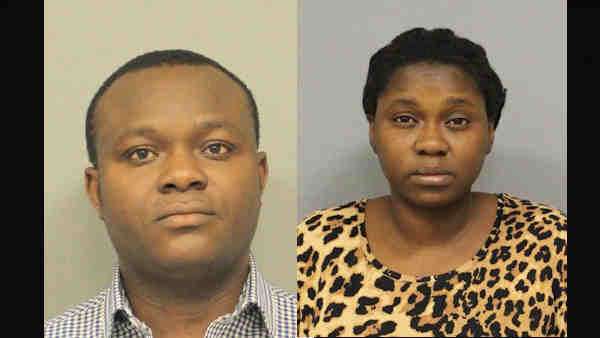 Oluwafeyi Faniyi, 30, and Olufemi Faniyi, 32, both of Roosevelt, were arrested Monday, and charged with second-degree assault and endangering welfare of a child. According to the Nassau County Police Department, while at their residence, they disciplined their son, 8, for misbehaving by whipping him with an extension cord of some kind. A teacher at the child's school noticed cuts on his back and arms. The victim was taken to a hospital where he was treated and released to a family member. Both defendants were scheduled for arraignment Saturday in Hempstead.